Results: A more durable catalytic material for fuel cells has been discovered by scientists at Pacific Northwest National Laboratory, Princeton University, and Washington State University. They combined graphene, a one-atom-thick honeycomb of carbon with good electrical and structural properties, with metal oxide nanoparticles to stabilize a fuel cell catalyst for better catalytic action. "This material has great potential to make fuel cells cheaper and last longer," said PNNL Catalytic chemist Yong Wang. Why It Matters: Fuel cells are a promising, clean-burning alternative to fossil fuels. The primary limitation for large-scale production of consumer fuel cells is materials and manufacturing cost. Fuel cells work by chemically breaking down oxygen and hydrogen gases to create an electrical current, producing water and heat in the process. The centerpiece of the fuel cell is the chemical catalyst, often employing expensive metals such as platinum, to spur the chemical reaction. Developing a practical, safe, and efficient fuel cell would be a major step in solving our rising energy costs and environmental concerns. Methods: To work effectively and efficiently in a fuel cell, a chemical catalyst such as platinum requires a good support. The support provides the base for electrical conductivity and allows an even spread of the catalyst to provide maximum surface area for the gas reactants. Common supports are carbon black and metal oxides, but these materials have disadvantages. Platinum atoms tend to clump on carbon, losing effectiveness. Plus, water in the process can degrade away the carbon support. Though they provide a stable and good support for catalyst dispersion, metal oxides are difficult to synthesize and are not conductive enough. Combining these materials has the potential to get the best of both worlds. 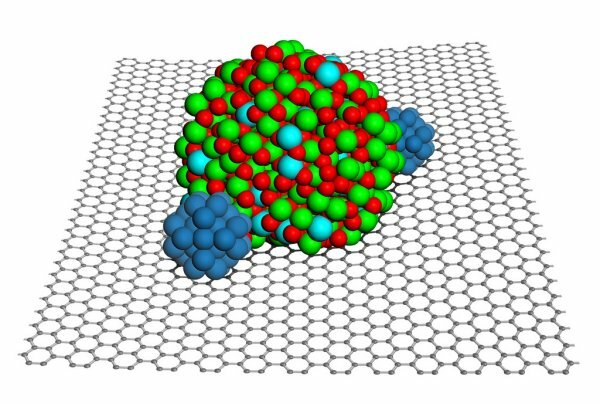 The team of researchers selected graphene, a carbon lattice that provides a porous and ample surface area for platinum molecules to work. To the specially treated graphene, they added crystallized nanoparticles of indium tin oxide (ITO), a metal oxide. Using a transmission electron microscope at the Environmental Molecular Sciences Laboratory (EMSL), they viewed images that showed platinum spreading out well on the hybrid support. In addition, the platinum wedged between the ITO nanoparticles and the graphene surface, with the nanoparticles acting like a paperweight on the catalyst. The team calls this structure a "metal-metal oxide-graphene" triple junction. Using this platform for a new catalyst design, the team employed EMSL's Chinook supercomputer to calculate molecular stability. Their calculations showed that the combination of graphene, platinum, and ITO was more stable than metal oxide alone on graphene, or the platinum alone on graphene. Testing for effectiveness of the catalytic reaction showed the combined three materials provided about 40% more effectiveness than the catalyst alone on graphene, or alone on other carbon-based supports such as activated carbon. Finally, the team artificially aged the material to test the durability of the reaction. After aging, the material proved to be three times as durable as the lone catalyst on graphene and twice as durable as commonly used activated carbon. "The unique structure of this material provides much needed stability, good electrical conductivity, and other desired properties," said PNNL materials scientist Jun Liu, an investigator on the research team. What's Next: The research team is working on incorporating the platinum-ITO-graphene material into experimental fuel cells to determine how well this structure works under real world conditions and how long it lasts. Acknowledgments: This research was supported by the U.S. Department of Energy's Office of Energy Efficiency and Renewable Energy Fuel Cell Technologies Program and was performed by Rong Kou, Yuyan Shao, Donghai Mei, Zimin Nie, Donghai Wang, Chongmin Wang, Vilayanur V. Viswanathan, Sehkyu Park, Yuehe Lin, Yong Wang (Joint Appointment with Washington State University), and Jun Liu, PNNL; and Ilhan A. Aksay of Princeton's Department of Chemical and Biological Engineering. The team used computing and microscopy resources at EMSL, a DOE national scientific user facility located at PNNL. Reference: Kou R, Y Shao, D Mei, Z Nie, D Wang, C Wang, VV Viswanathan, S Park, I A Aksay, Y Lin, Y Wang and J Liu. 2011. "Stabilization of Electrocatalytic Material Nanoparticles at Metal-Metal Oxide-Graphene Triple Junction Points." Journal of the American Chemical Society 133(8):2541-2547. DOI: 10.1021/ja107719.